1 Heat some oil in a heavy bottomed saucepan, then fry the onions over a low heat until soft but not coloured. Add the garlic, paprika and cumin, and stir for a minute or so, until fragrant. 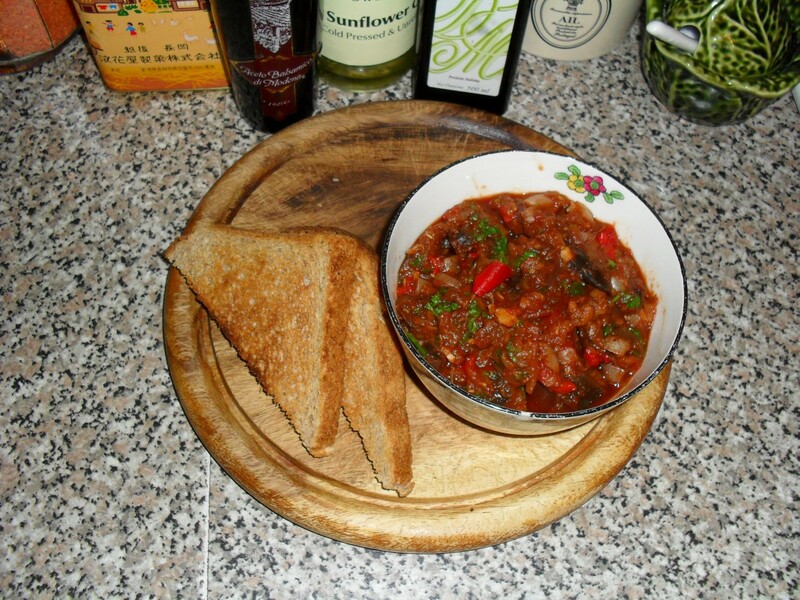 2 Add the red pepper and aubergine, and cook for about 10 minutes, stirring occasionally, until the vegetables are soft. If the aubergine starts to stick to the bottom of the pan, add a little more oil, or a drop of water. 3 Pour in the tin of tomatoes, add the sugar, and season with salt and pepper to taste. Simmer for about 20 minutes or so, until the vegetables are very soft and it’s all melded together. Check it every now and then to make sure the liquid hasn’t all disappeared, and add a little water if necessary. But you don’t want it to be very liquidy. 4 Squeeze over the juice from the lemon and add the chopped parsley. Stir through, check the seasoning, then allow to cool slightly before serving with flat bread as a starter, or tortilla chips as a snack.